Sportfishing and Mazatlan go together like a rod and reel. Its status as the largest Pacific Coast port in Mexico -- with the country's biggest sportfishing fleet -- ensures its reputation as a premier destination for sportfishing. Those heading out to sea can book fishing expeditions from among several sportfishing operations comprsiing more than five dozen boats. 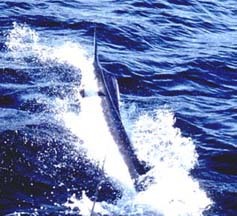 Record-size sailfish; black, blue and striped marlin; tuna; sea bass; dorado; and grouper are regularly caught by avid anglers. In addition to excellent deep-sea action, anglers can also test their skills in nearby freshwater lakes offering some of the best bass fishing in the world. A full-day charter with equipment and guides starts at about $250 to $300. Charters typically include a full day of fishing, lunch, bait and tackle. They depart between 6:30 and 7 a.m. from the fishing marina in the harbor or from the El Cid Marina. They generally return after 2:30 p.m.
Those who wish to reserve fishing charters should do so when booking hotel accomodations. So please let us know your fishing need when you call us to book for your vacation to Mazatlan. Mexican law requires that anglers over 16 must have a valid fishing license. The charters often make arrangements for acquiring licenses for visitors planning to go fishing. Otherwise, a license can be obtained at the sportfishing marina or the Mazatlan port office. Try Your Luck on the Lakes Visitors who prefer freshwater fishing can cast their lines is nearby lakes. El Salto and Lake Comedero have both been stocked with native black bass and Florida black bass, Anglers will also find excellent fishing for trout, catfish and tilapia. Fishing Calendar Mazatlan's sportfishing is excellent throughout the year. Prime times for swardfish and striped marlin are from January to April; blue marlin, May to December; black marlin, July to December; sailfish, March to December; dorado, March to December; and tuna all year round. Note: Sportfishing boats tend to book up between October and January, so advance reservations are recommended.